we take special care to the fine details. length allows for more control on hand hammered cymbals. Every Bopworks stick is weighed in grams instead of ounces. This ensures proper matching in every pair you buy. "The average drummer usually uses two to four cymbals. To have any more than that is totally unnecessary, because where are you going to put them anyway, and how are you going to reach them? They shouldn't be there just for looks. I notice that most people have crash, crash, splash, ride, and hi-hat. Very few young drummers play on their hi hats, except in the rock situation where they generally play them closed and they play their 8th-note beat on them. They should learn that the hi hat is another ride cymbal to be played properly—"ta, da-ka, ta, da-ka, ta," changing rhythms and all that, open/closed, all open, half open, half closed. There are a lot of effects. To me, the hi-hat is another ride cymbal. But every cymbal should be a ride cymbal and every cymbal should be a crash cymbal. I've been noticing that almost everyone has only one ride cymbal and a million crash cymbals. You don't need the crash cymbals. You need the ride cymbals, because that's where your whole thing is coming from. Crash cymbals are only for accents, so you can hit any cymbal for a crash. " I love the weight, balance, length, tip, and taper of these sticks. I love every pair of Bopworks sticks I have ever purchased. Old world craftsmanship with modern consistency. Try 'em. They're great! I ha w been using the Mel Lewis 7d model BopWorks sticks for a year now . I love the balance and feel of this model stick. 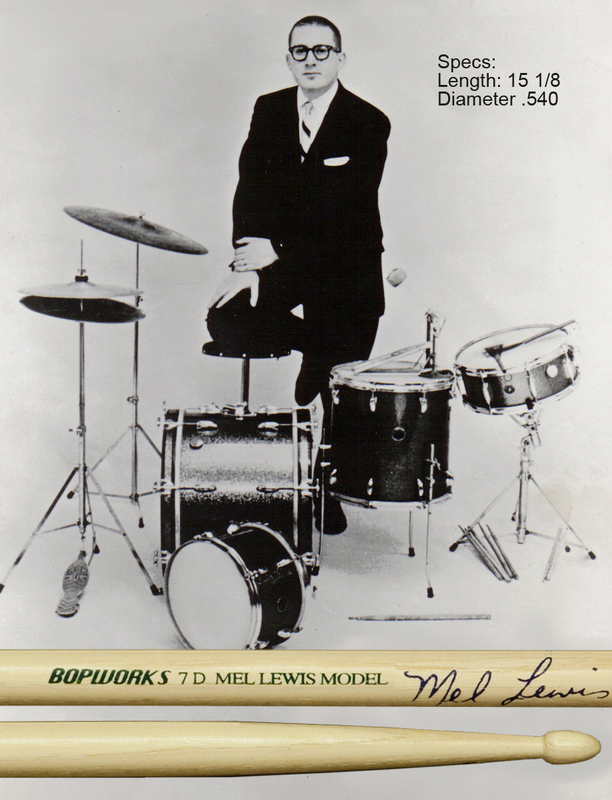 I have always been a big fan of Mel Lewis and this initially piqued my interest in this model stick . I love the balance and feel of these sticks and especially love the sound of these sticks on cymbals . The small acorn. Was really enhanced the stick definition and keeps the overtones in check nicely . The only ask I have these is that I wish BopWorks would offer a lacquered version similar to what Regal Tip does . It would make gripping these sticks easier and the tips to last a bit longer . that can sing at any volume. Great response no matter how you drive your DrumKit BOPWORKS has got your stick waiting for you. love the mel lewis stick! Authentic design, modern precision and consistency, and a long lost excellent transparency to the cymbal sound. Well done!! You'd think a lighter Jazz stick would be limited in applications. Not so- I use these in R&B settings as well as small Jazz trios/quartets. I perform as Ringo Starr in the Beatles tribute 1964. In the pursuit of accuracy, I did extensive research of the different drumsticks that Ringo used. Being that they were vintage models like the Ludwig pencil stick, they're no longer in production. I stumbled across BopWorks' Mel Lewis drumstick. It feels vintage, it sounds vintage, and it's perfectly balanced. Need I say more? The ultimate jazz drumstick at a competitive price.